Travelers, it’s time to upgrade your travel game to the next level. As summer is near, there is no better way to enjoy travelling than with all your vital tech gadgets. Some of the travel gadgets are just too fun to miss while the others add extra convenience to our experiences. These smart tools are life-savers for today’s travelers as they have forever changed the way we experience the world. They solve some of the most annoying travel problems and keep our stuff organized on the go. Here are some cool travel gadgets ready to make your trips safer, easier, or simply more enjoyable. If you are travelling to a place where even bottled water is questionable, then a handheld water purifier is the best for you. These generally destroy 99.9% of the bacteria, viruses and other organisms that can make you ill using ultraviolet light. These water purifiers can be used on collected rain water, tap water, ponds, rivers, and lakes and unfiltered reservoirs. 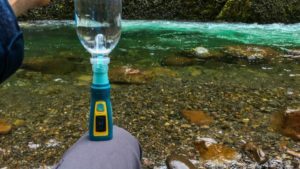 Easily carried in your pocket or purse, these portable environmental-friendly gadgets make drinking water safe quickly and effortlessly. The smallest of its kind in the world, this mini travel steam iron features a 420-watt motor and three fabric heating levels. Extremely useful for travelers, this steam iron can set crisp creases and remove wrinkles. Not only travelers but the college kids away from the home will also love its portability and ease of use. Whether you’re going on an African Safari or traveling to Europe, you are going to love Scrubba Wash Bag. This compact, flimsy wash bag will not only help you to do laundry anywhere but it will save your time and money. You’ll have your clothes fresh and clean in a few minutes- a bit of washing liquid and 2-3 liters of water is all it takes making it one of the best travel gadgets for campers, business travelers and backpackers. When traveling throughout the world, you always need an adapter for the different outlets and voltages in various countries. 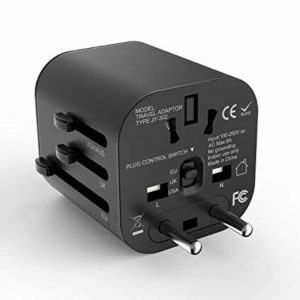 The Travel Adapter works all over the world covering over 150 countries including United States, Canada, UK, Europe, Ireland, Africa, Japan, New Zealand, etc. Protection against short circuits, overcurrent and overheating, it has FCC, CE and RoHS certified safety system. Its feature of installing in each outlet according to your demand makes it the ideal travel adapter. There is no need to drive around the world carrying several adapters. 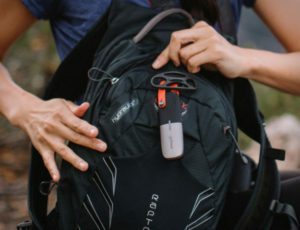 Compatible with iOS and Android, goTenna Mesh pairs to your phone and enables it to privately convey texts and GPS location between other goTenna devices. You don’t need phone services, towers, routers or satellites to use goTenna. Also, it enables end-to-end encryption for your private chats. Its free goTenna app includes detailed offline maps for any region in the world. 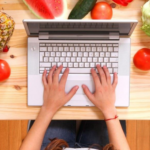 Power your own network, whenever and wherever you need it and you are good to go! Hope this was helpful. Let us know in the comments section what other travel gadgets you think are essential for travelers!